Our client plans to build and live on his land permanently. The orchard site was chosen pretty quickly due to the exposure of the rest of the land. It has a beautiful ampitheatre feel when you first arrive. The plan was to build a pond in the middle for water and plant fruit trees and as many as possible. We were to provide fruit trees that were of different varieties that produced at different times throughout the year and somewhere he could bring the children to forage and picnic under the fruit trees. 1. We employed a digger operator to sculpt out an easy access way leading to the orchard site to come and go. We designed the drive to capture any excess water, directing it down to the pond and keep it there. 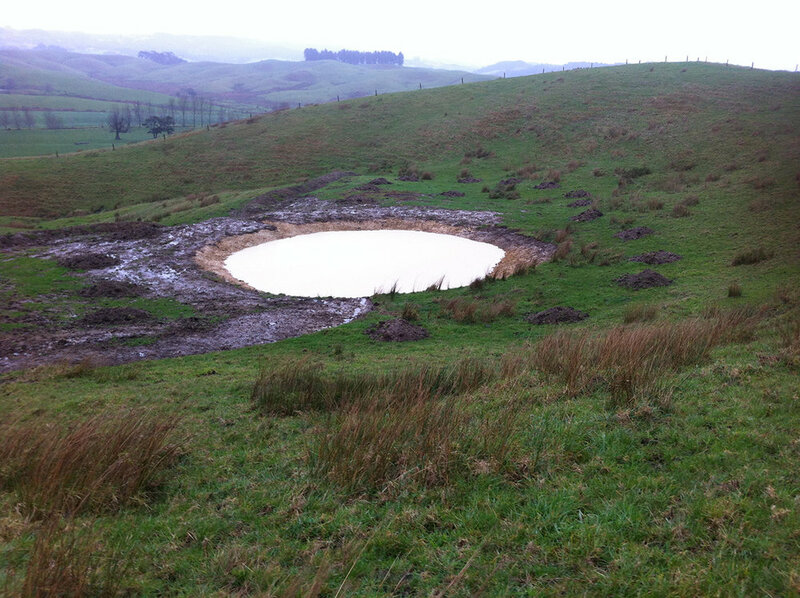 The pond was dug as deep as possible with a nice round shape to reflect the natural concave circle that was already there. 2. A flat area for a shed site and turn around bay was created, all excess soil from the pond and shed site was used to build up the southern mound for planting the native shelter belt and also used for the fruit tree positions. The ground was wet so we needed to build up the soil above the clay if we were to have a successful orchard. It is also very windy from the south, so the native shelter was most important to be planted out first. Ideally I wanted to wait a year until some shelter got up, but decided to plant some fruit trees. 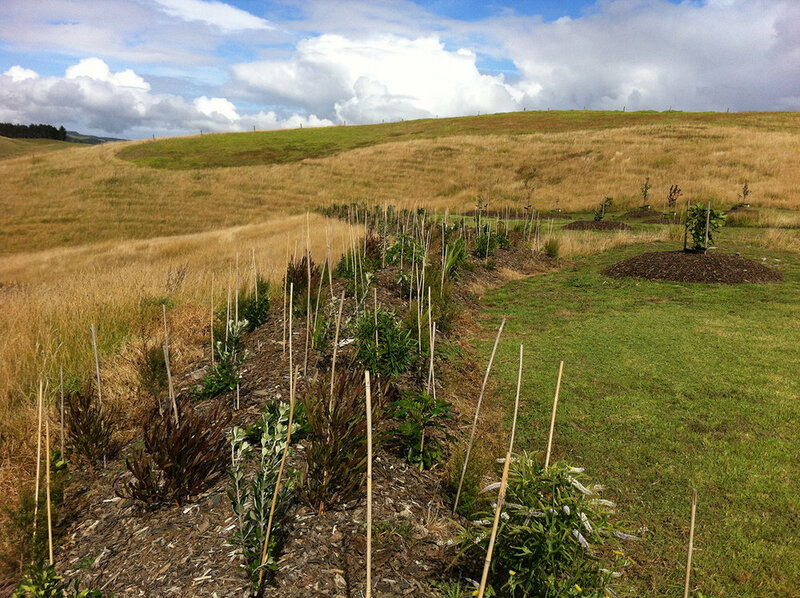 400 mixed species of natives were planted into the southern mound. 3. 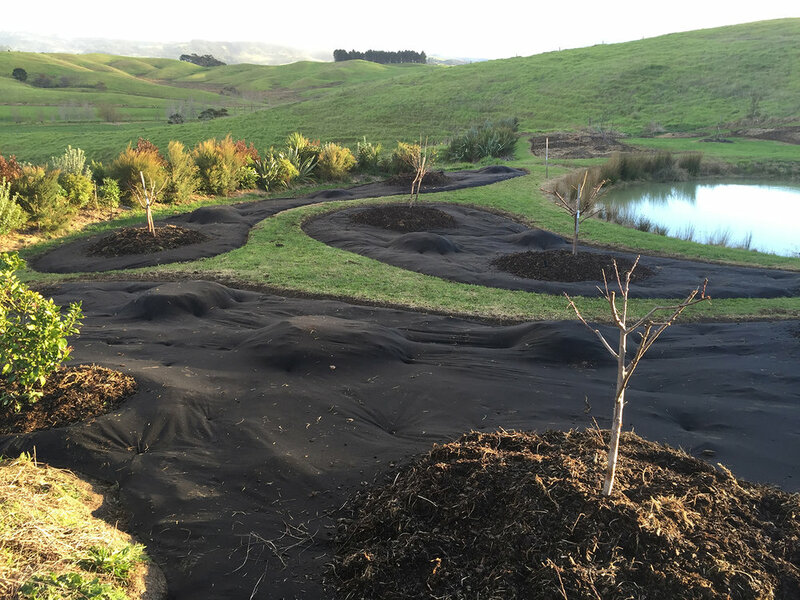 The mounds for the fruit trees were formed then weed matted and planted with a range of 24 fruit trees. 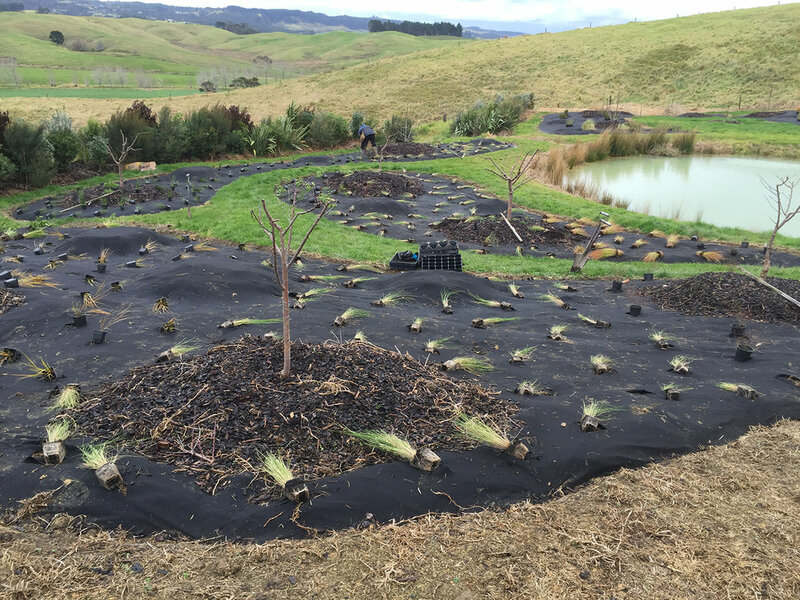 All natives and fruit trees were mulched, a snorkel was set up in the hole to aid in watering during the hot summer months. A fence was constructed around the whole orchard to keep livestock out. The 2nd year we remodeled the orchard to allow us more fruit tree positions and lessen the mowing time. 4. We designed bed systems throughout the entire garden incorporating what was already previously planted. This meant mowing a pattern we were happy with, spraying out the shape of the new garden bed before cultivating. All cultivated areas were edged for mat laying, this fluffed up the soil for mounding up for the new fruit tree positions. The new shape of the beds came up really well, gaining another 26 fruit tree positions. 5. All beds were planted with a range of 1000 ground covering plants from coprosma red rocks, coprosma poor knights, grevillia red rambler, juncus gregiflorus, poa cita, anemanthele, carex virgate, carex testacea, perennial flowers and miniature toi toi. 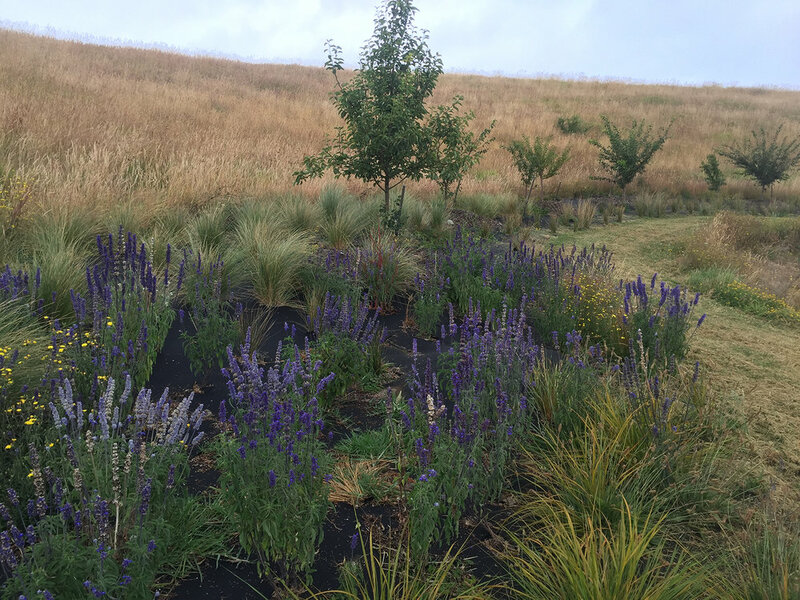 The patterns of these plantings were important to me, I wanted a flowing continuity of colour which looks amazing from the initial planting and for years to come. 9 new fruit trees were planted this year and 17 will be planted next year. We added in apricots and new varieties of figs, apples, peaches and plums. To conclude: A low maintenance orchard landscape in the middle of rural farmland with the pond as a feature and focal point. Next is to enhance the pond area and modify it into a swimming pond with planting and boardwalks.